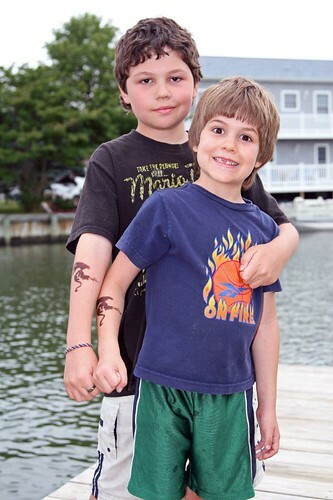 A while back I promised Not June that I would post pictures of the boys annual henna tattoos. Not wanting to be someone who goes back on her word, here they are! In case you can not tell what they are, they are dragons. And can you tell that Kyle is in that wonderful 7 year old phase where he loves to make goofy faces at the camera and Jason is in that 10 year old phase where he just tries to be so nonchalant about the whole thing? I just realized that I forgot to take a picture of mine…a flower on my ankle. Mine never seem to last as long at the boys' tattoos do for some reason. Good news on the weather front! Summer has returned. Spent a glorious day at the beach today. The waves were really rough and were the tallest I have seen them all summer. The life guards pulled everyone out of the water a couple of times to warn us about rip currents. Made for very good boogie boarding and I managed not to get bent over backwards this time. The boys had fun playing with Grandpa Elms in the waves. I got some video on my point and shoot camera. Now I just need to figure out how to upload it. I guess that means that I will actually have to make the move into figuring out YouTube.